Cooler Master H500 front mounted SSD? 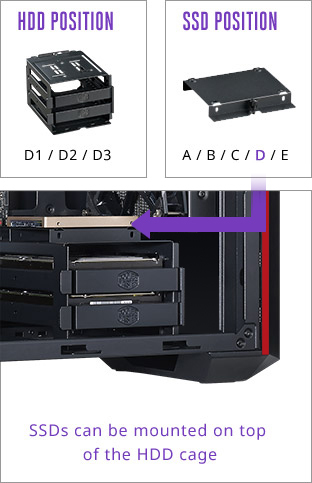 I spent some time looking at the photos og the Cooler Master H500 (the case I plan to get) and while it has 2 rear mounted SSD options (behind the motherboard) I was looking above the HDD rack at the bottom, and there seems to be some holes and whatnot. Could I mount my SSD on top of the rack? I'm getting the Team Delta 1tb RGB SSD and wanna show it off when I build my rig. I actually can't find a link to the part because it's not sold as a spare case part by CoolerMaster. Instead I was sponsored by CoolerMaster and I asked for that part specifically. You could try Ebay. To add, that caddy houses two 2.5" drives. Like I mentioned earlier, you can try and work with the holes atop the HDD cage or rather look at a case that allows you to show off the SSD's RGB. You could look at SSD's mounted to the motherboard wall that face the viewable end of the side panel in a case...? I told you, you wont find it. I had to get in touch with the reps in Taiwan and after a lengthy explanation of why I wanted it, they granted me access to it. Hence why I said Ebay or being creative. Question NZXT H500 / P350X / CM MB511 which case to choose? [SOLVED] [Cooler Master MasterBox Pro 5 RGB] What are these cables? Question Is my GPU safe to ressemble and use?